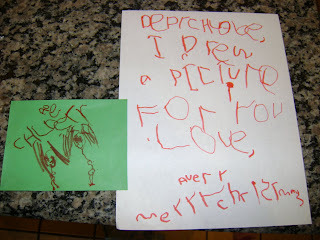 A little before Christmas, Avery was drawing at the table and told me she had drawn a picture for her friend Chloe. She insisted she wanted to mail it to her, so I encouraged her to add a letter with it. I spelled out the words she came up with and she wrote all the letters herself. I am so proud of her writing abilities at her young age and her reading ability is already out of this world for a girl not even 4 years old. I've always known this girl was a smartie, but she still continues to blow me away!